These days it seems like everyone has a digital SLR camera. Unfortunately though, most people only take photos using the fully automatic settings, otherwise known as the Green Rectangle by Canon users. If you fall into this category, you almost might as well be using a point-and-shoot instead. Your DSLR has so much more to offer you if you take the time to learn the basics of how your camera works. Learn how to get off of auto and into manual! In this introduction to photography class we will cover shutter-speed, aperture (f-stops), depth of field, ISO, RAW vs. JPG, memory cards, white-balance, aperture priority (dial settings Av and A), shutter speed priority (dial settings Tv and S), autofocus settings, suggested settings for specific situations, basic fill flash, as well as basic rules of composition. Handouts will be provided covering the basic skills addressed in the class. The class usually takes between 2.5-3 hours depending on how many questions you have. Class requirements: A digital SLR Camera (i.e. Canon Rebel, Nikon D series, Sony Alpha, or Pentax K), and a memory card that is at least 1GB. Other useful items to bring with you are an extra battery and your camera’s instruction manual, but they are not required. Can’t make it out to the Metro Boston area? Try my book, How to Get Off the Green Auto Setting: A Practical Guide to DSLR Photography for Beginners. It is available on Amazon.com in print and kindle editions. Sure your camera may have a pop-up flash, but when you use it your shots seem to look just like your friends’ with point and shoots and nothing like shots the pros take. That’s because you aren’t using your camera’s hot shoe with a speedlite. In this class we will go over the use of flash photography using flash guns commonly referred to as Speedlites. In this hour and a half class we will cover Manual vs. TTL settings, limitations of flash, fill flash, bouncing the flash, high speed sync, flash brackets, diffusers, and white cards (both home made and commercially available). Handouts will be provided covering the basic skills addressed in the class. The class usually takes about 2 hours. Class requirements: While one does not need to have speedlite to attend the class, the class is intended to be a hands on learning experience. Bringing a speedlight, two full sets of batteries for your flash, as well as your digital SLR Camera and a memory card that is at least 1GB, is preferable. Other useful items to bring with you are an extra battery and your camera’s instruction manual and your speedlite’s instruction manual, but they are not required. You know the difference 1/1000 shutter speed and 1000 ISO and the affect it will have on your images. Now that you know how to get a well exposed image you are ready to start honing your craft. There is so much more to photography than just getting the settings right. In this hour and a half class we will go over the basics of posing people (individuals as well as groups), traditional rules of composition, bokeh, the effects of different focal length lenses, effects of a crop sensor vs. full frame sensor, and telling a story with your images. Handouts will be provided covering the basic skills addressed in the class. This class usually takes about 2 hours. Class requirements: A digital SLR Camera, and a memory card that is at least 1GB. Now that photography has gone digital, you don’t need a separate room of your house to develop your photographs using hazardous chemicals, instead you use your computer. In this two-hour class we will go over the basics of importing RAW images and exporting JPG files, image library management, sharpening for different viewing mediums (paper vs. a computer screen), white balance, exposure, vignettes, teeth whitening, red eye removal, spot removal, spot burning and dodging, cropping and rotation, importance of monitor calibration, and lightroom presets. Handouts will be provided covering the basic skills addressed in the class. This class usually takes between 2-3 hours depending on how comfortable you are with computers. Class requirements: A laptop running Adobe LR 4 or LR 5. Just about everyone has heard of photoshop, but not everyone knows how to use it. During this class learn skills such as how to air brush away pimples and remove unwanted objects, and create layer transparencies. Handouts will be provided covering the basic skills addressed in the class. This class usually takes about 2-3 hours. Class requirements: A laptop running Adobe Photoshop CS2, CS3, CS4, CS5, CS6 or Creative Cloud. Photography started out as just a hobby for me and now I make my living doing it. During this 2-day workshop we’ll go over how to start your photography business from scratch. We’ll cover incorporation, online proofing and sales, business models for photography, types of photography jobs, how to get on-the-job experience, creating your brand, basic wordpress website design, acquisition of new gear, insurance, contracts, accounting, sales tax, portfolio creation, portfolio curation, utilizing social media, finding clients, and advertising. $499/person for group workshops. $900/person for individual workshop. Vail’s love of photography started early. For her 8th birthday, her mother gave Vail her old SLR from the 1960s. As she got older, this hobby turned into a passion. Vail took photography classes at her high school and was the photo editor of the yearbook for 3 years. In college she had the privilege of taking a photography course from Steven H. Begleiter, who began his career as first photo assistant for Annie Leibovitz. 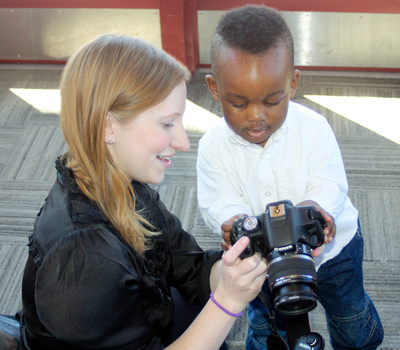 Vail went on to get her Ph.D. in bioethics, but her love of photography only grew stronger. After attending many a wedding and hearing from her friends and family that the shots she took were better than those by their hired pros, she decided to take the plunge and started Fucci’s Photos so that her passion could become her profession. To gain experience in wedding photography, she was a second shooter and assistant for Daniel McGarrity. From these humble beginnings Vail has gone on to become awedding wire bride’s choice award winner in 2011 and 2012. In 2012 she ventured into the world of fashion photography and shot shows at NYC Mercedes-Benz Fashion Week for Kryolan Professional Make-Up. In October 2012, Vail was honored to be a speaker at Kevin Kubota’s Photographers Ignite. Vail is available to teach private photography lessons, workshops, and group lessons. Canon 70D, Canon 80D, Canon T7i, or Canon T6i: Any of these cameras will do a fantastic job for a photo enthusiast of varying levels of ability. From a person who knows nothing about photography, up to someone who likes to shoot in manual all the time. These cameras will do the job nicely and are under $1000. Canon 5D Mark III, Canon 5d Mark IV, Canon 1Dx, Canon 1Dx Mark II, or Canon 7D Mark II: These cameras are for a person ready to jump to a professional level camera body. All three of these cameras are weather sealed so they can be taken in much harsher conditions than consumer grade cameras and have more durable shutters that will last longer. The 5D Mark III and the 1Dx are both full frame cameras. The 7D Mark II is a crop sensor. The 1Dx is the top of the line for Canon’s dSLRs. The 1Dx boasts up to 14 frames per second, the 7D Mark II is 10 frames per second, and the 5D Mark III is 6 frames per second. The 5D Mark IV is 7 frames a second and can shoot 4K video. The 1Dx is the only camera in the canon line up that has spot metering linked to the focus point. For each of these cameras I would suggest buying the body only and then buying the lenses for the camera separately. The L lenses that come packaged with most of these bodies do not have a very large maximum aperture. 2 Sandisk 32GB SD Cards: the only memory card company I suggest people use is Sandisk. They are the very best and most reliable. They are a little bit more expensive than the competition but they are much less likely to result in card failures than other brands. Always own at least 2 memory cards as you don’t want to be left having to delete shots because your card filled up. I would suggest purchasing either 16GB size or 32GB size. A second camera battery: it is a smart idea to have at least 2 batteries for your camera, particularly if you are taking the camera on trips where electricity will be in short supply. I suggest getting only Canon brand batteries, not 3rd party versions. External hard drive: the pictures we take are very important to us. Nowadays people everyone just leaves pictures on their computer hard drives. Unfortunately, these devices are prone to failure. So be sure to have a backup. I suggest all my students have an on site external hard drive and an off site back up as well. Now you can get Terabyte hard drives that cost only about $100! Camera bag: You should have a properly padded bag to transport your camera with you. Digital SLR cameras are expensive and delicate. A good camera bag can help keep your camera in good working order for years to come. Photo editing software: I suggest to all my students that they get Adobe Light Room 6 or a subscription to Adobe Creative Cloud at $9.99/month which also includes photoshop. This is an amazing user friendly program that will allow you to edit your images and catalog them as well. If you are currently a student at a high school or college or are a teacher you may qualify for the discounted student’s version. You must have a valid student id or teacher’s id to be able to activate this discounted academic version, which is exactly the same as the non-academic version, just cheaper. Light Room 5 is so great you will likely not need any other photo editing software, but if you want to be able to do more advanced edits than Adobe Light Room is capable of you can also get Adobe’s Photoshop Elements. Elements is a stripped down version of their very popular program Photoshop, which is aimed at professional photographers and graphic designers. Canon 50mm 1.8 “nifty fifty” lens: this is one of the very best photography buys on the market. For a lens that is only $110 you get amazing image quality and all the benefits of a maximum F 1.8 aperture lens. This allows you to have nice blurry background with your subjects in crisp focus. It also lets you shoot in much lower light than the kit lens that comes with the camera does. Once most of my students put this lens on their camera they never want to shoot with anything else because the pictures are so much better. If you are thinking of making photography a serious hobby you may want to skip right to the more expensive Canon 50mm 1.4. Canon 55mm-250mm 4.0-5.6 IS lens: If you are shooting things like your children’s soccer game this lens will become your best friend. It allows you to zoom in on the action and has Canon’s Image Stabilization technology to help you get a steadier shot. Canon 24mm-70mm L 2.8 lens: For those who are ready to jump to the next level the first L lens I suggest people buy is the 24-70. It is extremely versatile, is tack sharp, and focuses incredibly quickly. The large 2.8 aperture allows for beautiful shallow depth of field. Canon 70mm-200 L 2.8 Lens: This is the lens I use when I shoot the runways at fashion week in New York City. It is also wonderful for sports. It is very heavy though. You need to either be very strong or use a monopod when using this lens for any extended period of time. It is a fantastic portrait lens as well. Canon 135 L 2.0 Lens: This lens is my personal favorite. It focuses so quickly it blows my mind. It is what I love to use for portraits. Unlike the 70-200L lens it isn’t terribly heavy, so I can hold it for extended periods of time without a monopod and still get steady shots. The bokeh is creamy and beautiful. I find for portraits it just can’t be beat. Canon 100-400 L 4.5-5.6 Lens: If you are taking shots of high speed action from the sidelines during the day or are going on a daytime safari, this is a wonderful lens. The only drawback is the variable aperture and it is not particularly “fast glass” with a maximum aperture of f/4.5, so it is best suited for shooting on bright sunny days. Canon 430 EXII speedlite: This is an external flash for your camera that is much more powerful than the one that pops up on the camera and can be used to bounce the flash so that you get much better results when doing flash photography. Canon does make weaker and more powerful flashes. Most students outgrow the less powerful 270 EXII speedlite quickly and want the versatility afforded by the 430EXII. Others may choose to go ahead and purchase the more powerful professional grade 600EX-RT at the very start. Usually I don’t suggest using third party equipment, but the Yongnuo 600EX is also a very good flash for the money. Rechargeable AA Batteries: Flashes eat up batteries quickly. Rechargeable ones will save you money over time. I suggest the ones that hold their charge for a long time like the high capacity Powerex ones. Nikon D3400 or Nikon D5600: Either of these cameras will do a fantastic job for a photo enthusiast of varying levels of ability. From a person who knows nothing about photography, up to someone who likes to shoot in manual all the time. These cameras will do the job nicely and are under $1000. Nikon D5 or Nikon D850: These cameras are for a person ready to jump to a professional level camera body. Both are weather sealed so they can be taken in much harsher conditions than consumer grade cameras and have more durable shutters that will last longer. The D4s and the D810 are both full frame cameras. A second camera battery: it is a smart idea to have at least 2 batteries for your camera, particularly if you are taking the camera on trips where electricity will be in short supply. I suggest getting only Nikon brand batteries, not 3rd party versions. Nikon 50mm 1.8 lens: This lens allows you to have nice blurry background with your subjects in crisp focus. It also lets you shoot in much lower light than the kit lens that comes with the camera does. Once most of my students put this lens on their camera they never want to shoot with anything else because the pictures are so much better. If you are thinking of making photography a serious hobby you may want to skip right to the more expensive Nikon 50mm 1.4. Do not get the cheaper versions of these lenses from Nikon. They do not work with most consumer grade Nikon cameras. Nikon 55mm-200mm 4.0-5.6 VR lens: If you are shooting things like your children’s soccer game this lens will become your best friend. It allows you to zoom in on the action and has Nikon’s Vibration Reduction technology to help you get a steadier shot. Nikon 24mm-70mm 2.8 lens: For those who are ready to jump to the next level the first professional grade lens I suggest people buy is the 24-70. It is extremely versatile, is tack sharp, and focuses incredibly quickly. The large 2.8 aperture allows for beautiful shallow depth of field. Nikon 70mm-200 2.8 VRII Lens: This is the lens focal length I use when I shoot the runways at fashion week in New York City. It is also wonderful for sports. It is very heavy though. You need to either be very strong or use a monopod when using this lens for any extended period of time. It is a fantastic portrait lens as well. Nikon SB-700 Speedlight: This is an external flash for your camera that is much more powerful than the one that pops up on the camera and can be used to bounce the flash so that you get much better results when doing flash photography. Canon does make weaker and more powerful flashes. Most students outgrow the less powerful SB-400 quickly and want the versatility afforded by the SB-700. Others may choose to go ahead and purchase the more powerful professional grade SB-910 at the very start. Fucci’s Photos LLC is a participant in the Amazon Services LLC Associates Program, an affiliate advertising program designed to provide a means for sites to earn advertising fees by advertising and linking to amazon.com. All the products Vail Fucci has mentioned above are ones she has personally picked out. She does not receive endorsements directly from the companies that make the products.